This will be a lengthy post, as it includes 2 letters to IRS Commissioner Douglas Shulman followed by my entire IRS communication file. I apologize in advance for such a long posting, and you have my permission not to read all of it it! It is a follow-on, to my previous post entitled OVDI Drudgery for Minnows where I offer my recommendations for those agonizing over what to do now that they have discovered their Citizenship tax filing failures, or FBAR and/of FATCA form filing non compliance. I have been thinking about doing this for sometime, but his comment has stirred me to do it sooner, rather than later. Communication or feedback to a huge bureaucracy always, on the face of it, seems fruitless. What’s the point, you might ask? What is the chance that you will be heard, or that someone will act on what you say? Frankly, even now, after all my efforts, I do not have the answer to those questions, but I do know that without it, nothing will happen. So, with this post, I am going to focus on my past idealistic communication efforts to Commissioner Shulman. One is my original letter to the Commissioner immediately after joining the 2009 OVDP. Two is my final letter to him when I was facing an unknown OVDP outcome and no penalty relief was in sight. I had not yet appealed to the Tax Advocate Service (TAS) for a modified result which I will explain later in this piece. I will let you read these letters, look over my attempts to communication through out the OVDP, and you can judge for yourself if you think I was heard or if my comments were “carefully considered”. Also, this might give you a deeper understanding of the process one goes through when they “Voluntarily Disclose” in an honest and forthright attempt to come back into compliance with tax requirements not previously known. While life does go on after the trauma of the experience, and you may find some positive aspects later, while you are going through it, it is hell. The expense in life credit units (LCUs) is never tallied on any reconciliation spreadsheet! Bottom-line, I do think the exercise was worth the effort, if for no other reason then to demonstrate my good faith efforts to be compliant with laws now discovered, and to communicate the fears I had about the unintended consequences of the OVDP program. I would encourage you to take the time to communicate in written letter form also. Realistically, you may never really know what they will ‘take on board’ from your letter, or what they will just ignore. But even if they ignore it, you have to do it, in my opinion. You must make a record of your concerns and protest. In this I join with 30 year IRS veteran to encourage you to write the Commissioner, although I understand that those struggling with the decision on what to do now, and who have not yet done their OVDI Drudgery assignment might be reticent to write. At the time I wrote my letter to Shulman, I was ‘all in’, so to speak. I had nothing else to lose, or so I thought! Little did I know what lay ahead in the agony of the process, lack of discretion that would hamstring reasonableness, and the surprise penalty assertion that came later as a ‘kick in the gut’ that just stunned me. So, if you are all ready in the OVDI, use whatever ideas you want from my letters to construct your own to the Commissioner. If you are not residing in American and an accidental US citizen or dual citizen and you are not going to comply with FBAR and income tax reporting requirements; or if you are an immigrant now leaving the country and your Green Card behind; or if you are in the process of relinquishment or renouncing of your US citizenship and you feel safe enough in your decision, you definitely need to write the Commissioner in addition to posting your story on this blog. If you are in or were in one of the VD programs, you definitely need to write. He needs to hear directly from you about the impact his broad brush jihad is having on you personally. It would be nice if he read comments online, but I doubt he will be reading the Isaac Brock blog. One thing my experience confirms, a letter sent to his office does get read somewhere in the IRS upper/middle management ranks. There are humans there, with feelings, and have real blood traversing their veins just like us. They are not monsters. They might be out of touch, or operate in a technocrats bubble that you and I don’t relate to. However, I cannot characterize them with the same broad brush generalities that their programs and press releases have characterized us. They might even empathize with the impacts this program has had on your life once they become aware of them. Those feelings might actually become part of some executive summary that is prepared for Shulman about the letters that have come in. It might be discussed in a staff meeting on the unintended impacts of their program. He, like Obama, may actually select a few letters to read personally, and maybe it will be yours! Your unique persuasion or point of view could be the one that alters the course of this gigantic misguided bureaucratic ship! You just never know. Nothing ventured, nothing gained! My first Shulman letter was responded to by letter about 6 months later. It came from Kevin McCarthy, The Acting Director, Fraud/BSA Small Business/Self-Employed Division, Department of Treasury, IRS. It was an unsatisfactory reply, but I wrote back with respectful appreciation of the response and consideration. In his letter, Kevin acknowledged my letter to the Commissioner, apologized for the tardy response, restated the FAQs of the program including the infamous FAQ 35, and restated assertions about the uniform penalty structure designed for predictability and consistency. Further, he said I could reject the 20% penalty and go a standard audit route with implications that this would be much more severe. (No procedures on how to do this were provided until June 1, 2011.) He concluded that no provisions were being made inside the OVDP for two-track process for Minnows, so to speak. Only outside the program where heavier civil penalties and criminal prosecution can occur was this even considered. The message was clear. Stay in the program! The response to my second letter to Shulman came via email from a Kurt E Branning, Territory Manager SB/SE Exam Western Area and after I had already appealed to TAS. It basically acknowledged my letter to Commissioner Shulman, told me to make a FAQ 35 appeal via the TAS, and if examination did not produce a different penalty option then I should Opt Out. At this time there were only rumors of one person Opting Out to date. Neither my examiner or her manager knew what that outcome was or what to expect out of the new Opt Out procedures just released. There was no other anecdotal evidence of how the process was preceding. It is only recently that Moby and Sally have reported back on their Opt Outs. Those are the only two I have seen. The results are encouraging even if the time and energy it takes to get to the point that you can is very draining in LCUs. In the end, it was the first letter response by Kevin which ended up being my ticket out of OVDP hell. It was on the basis of his restating FAQ 35 that allowed Kurt, to instruct the examination department to allow the consideration of a lower penalty structure using FAQ 35 guidelines. It is important to note, that this instruction came only after the TAS had agreed to take my case. Kurt decided to allow that relief under FAQ 35 retroactively. At the time of the TAS appeal, FAQ 35 had been rescinded and examiners were not allowed to use it. The letter rescinding FAQ 35 was still secret and not published. At the time my examiner was unable to produce the guidance in writing, much to my frustration as well as the TAS. She could only tell me verbally what it said. She could only say that my application for FAQ 35 consideration was rejected. No penalty discretion was to be allowed! Did Shulman have any knowledge of my letters? Unknown. I have no assurance that Commissioner Shulman ever saw my letters or really considered them. Also, I do not know, if the actual decision makers that sat around a conference table somewhere in DC and came up with the OVDP program in the first place ever considered what I had to say. I have been asked many times why did I join the OVDP? Knowing what I know now, would I do it again? What would I recommend people to do now? I have answered this before elsewhere, and again can only speak to my flawed thinking about process at the time. My information was limited when I made the decision, and I might do it differently today? Not sure. Maybe my decision process bears repeating here. I am not saying it should be followed or providing advice on what one should do. When I first became aware of my non compliance and that there was this program designed for Whales, I began to view it as the IRS fisherman encircling me with his seine net. It never occurred to me prior to then, that I was a fish to be caught. I had naively never thought about offshore accounts as something that I needed to report. Stupid me! I had a hard time getting my Aussie wife to understand that this program (net) that the IRS marketed via NPR for rich evading Whales hiding funds in secret offshore accounts was encompassing us too. Frankly she was dismissive of the NPR story we heard as having no bearing on us. However, we did have so-called ‘offshore’ accounts in NZ where we were residing. She did have an account in Australia. The net was not just for the rich Whales. It was drawing around us too, and we had to take notice. Reluctantly she began to understand that the US treats her differently than Australia does. While I suppose I could have just ignored my new-found knowledge and pretended I hadn’t heard the story. I could have taken evasive action and dived deeper to escape the net through the hole in the bottom by doing either nothing except becoming compliant from the date of my knowledge forward. I could have done a Quiet Disclosure (QD) to clean up past sins in spite of the warnings by the IRS not to do that. However, any escape attempt now, it seemed to me, was a willful decision brought on by the presence of the net as cast. I feared that doing anything but entering the OVDP could come back against me in future arguments in an audit were I had been discovered via a QD (diving deep) or by sudden filings of FBARs, those heretofore unknown administrative form from Hell. Maybe I was too passive in allowing myself to be netted. Maybe I was too fearful and risk averse. I like to think I was just a good citizen that wants to be compliant with laws and regulations, no matter how ill logical or egregious they seem to be. I should have noticed the IRS vessel on the horizon long before the net was set and swam clear to safer harbors. However, I began to recognize that this fisherman has other fishing skills and other nets to come, (as shown by FATCA which came later), and with the Big Criminal Harpoon it was swinging around as its marketing tool of choice to threaten everyone into the net, I figured I had to join. Months later, my examiner tried to tell me that I didn’t have to join. It was voluntary decision on my part, so I must be a criminal, so to speak. “Just pay up and quit protesting” was the basic message, as there was nothing she could do. My response was an emphatic “Bull S…. this is not voluntary!”. Just because you put ‘voluntary’ in the title, doesn’t make it so. That is like calling deregulation of the coal industry a “Clean Air Act.” Sure, I voluntarily decide daily not to kill the annoying kids doing wheelies out front in the gravel turnout, but that voluntary decision is very much coerced by the penalties for disobeying the “Do not Kill” statutes to say nothing about the moral strictures of society and Ten Commandments. I know it is a bit of convoluted logic, but that was how I saw it at the time. At that point, I had to decide if I was going to cross the line into willful behavior (ie dive deep) or willing swim into the net of disclosure. QDs which seemed the reasonable and logical thing to do for any other homeland tax failure like Geithners, were ruled out by IRS language. Offshore account failure was being treated more harshly and differently than any other category of tax failure. By any rationale reading of the FAQs you knew they were strongly discouraging it with implied criminal prosecution threats. In the end, it was the “discretion” implications of FAQ 35 that finally got me some relief with the much appreciated help of the TAS. It took 26 months from entry in the OVDP to 906 closing agreement signatures. Without the TAS, I was fish fertilizer! I fully understand that other Minnows in similar circumstance saw the issues differently than me, and made other decisions. Today many more are struggling with the OVDI decision, as they are just now becoming aware of FBARs and this offshore jihad. If they make decisions different from mine, I can not fault them. If they go the QD route, or decide just to be compliant from now onward, I hope the IRS just leaves them well enough alone. It is a total waste of limited IRS resources that rightfully should be targeted at Homeland residing Whales engaged in actual tax evasion. Ok… End of preface. Sorry I am so wordy. 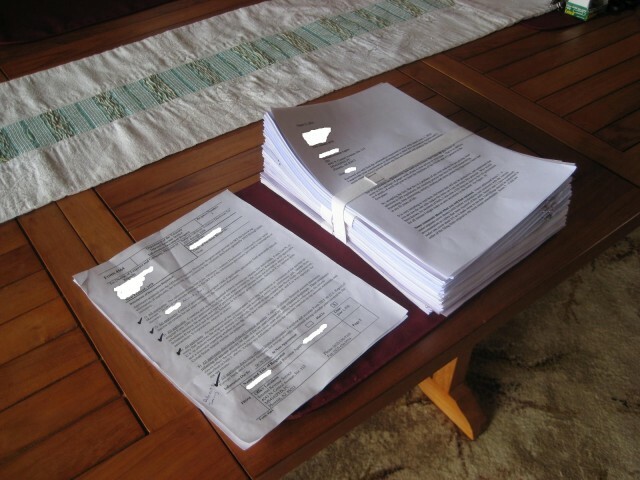 Here is the picture of what an OVDP Examiner submission looks like, for a simple financial life without a lot of complexity. All elements of this stack of paper will be discussed as Exhibits below. Now, here are my letters. You can read them for yourself to see if Shulman was listening and if my comments were “carefully considered’. This letter is a plea for reconsideration of Voluntary Disclosure penalties for “some holders” of overseas bank accounts. We are writing to you as a mixed nationality couple, married for 30 years and from the Washington State area. We have spent extended periods of time outside the US for much of the last 20 years, and now have a home in New Zealand. Marvin is a US citizen, and Sue is an Australian with US green card. This letter is not about them, or a defense of their evasion. This letter constitutes a plea for fairness for a much larger class of non compliant with much less sinister failures. These are more average US persons, like us, who in all likely hood, didn’t realize these rules applied to them. We are asking you re-consider the severity of the penalties for ordinary Americans of modest means like expatriates, resident aliens, and immigrants who prior to this time have been generally unaware of the FBAR and income tax requirements for normal and mundane overseas bank accounts like checking and savings. At the very worst, they have been benignly negligent non compliant rather than overt evaders looking for tax shelters. In spite of IRS publicity efforts, the story has been mis-characterized by the media. Millions are still unaware of the requirements to disclose. Yes, millions, and I think you know that to be true. These are not the high roller rich that are overtly hiding money in secret offshore Swiss Bank accounts that the press is talking about and focused on. That story line did not resonant with average folks. It did not raise much awareness of the larger story. These were efforts directed at even ordinary folks who have ordinary, non sophisticated banking in their home countries. It is only by luck or fate during a recent visit back to the States that we heard the story September 22nd on the radio. It was a painful discovery process that brought us to the understanding that this wasn’t just about the Rich. We almost wished we hadn’t heard it. We are now dealing with what we think are the severe, and unintended consequences of our voluntary actions to do what is right. It has been a highly stressful 3 weeks sorting it all out. We are now one couple of a very select minority that came to realize that this was a story of millions of average US persons being caught up in a regulatory process they don’t understand or realize applies to them. Arguably yes, they/we should have been aware, but for multiple reasons didn’t or still don’t understand. There are some real “Questions” in these requirements that don’t make logical and rationale sense to average the US person (IRS Technical definition), let alone immigrants and resident aliens of which my wife is one. The Voluntary Disclosure process was designed for so-called “Offshore tax shelters”, and for those that didn’t disclose, the door has just closed on October 15th. Very few in the larger category we are referring to have come into the fold either because of fear and intimidation of the process and penalties, or general lack of understanding that yes, these rules apply for all overseas accounts, not just the Rich using hidden accounts in countries with secrecy laws. You are recently quoted as saying “7,500 have come forward.” I assume this adds to the 345,000 that Senator Levin said had complied in 2008. If you compare this total number to the pool of millions who should have declared, the compliance rate is running in the low single digits (<3% by my math). That 7,500 must not give you comfort as to the success that is being publicly trumpeted. What about the 6.6 million expatriates the State Department thinks they are. They probably all have normal overseas banking arrangements. It is what normal people do. Do you think they should have all understood and come into the fold by now? 7,500 applications for current VDP implies that they don’t, and it appears that you are well short of a reasonable compliance goal on that number alone. …and I haven’t even mentioned the 37.5 million immigrants and or resident/work visa holders that may have bank accounts in their home countries. Those, that have declared, like us, have joined a very self selected minority that are now facing some pretty draconian penalties that were certainly designed for the Big Tax Evaders. Surely it did not envision ordinary folks being caught in this net cast by the IRS. These penalties are too severe for the alleged crimes of ignorance, benign negligence or omission. Our plea is NOT to make exceptions for us in the FBAR or income tax rules, although we do think the whole program should be resigned and updated for a financially connected and flat world. In 1970, having overseas accounts was exotic. Today, I reckon it is pretty mundane and mainstream. We plea with you instead to just consider a two tier penalty process that better accounts for those overtly evading taxes using banks with secrecy protection versus just benign negligence or omission by ordinary folks. I would think that the majority of the non compliant are in the latter group of modest means. They really are not the high rolling overt offenders that you were originally targeting. We now understand the errors of our ways. We now understand the need to clean up our past. We will pay past taxes due, and file forms as required going forward. We will never be non compliant again! Fear has been instilled, and a big lesson has been learned. It is a very painful one emotionally, financially and in hours devoted to make everything right. It is especially hard on my green card-carrying Australian wife. To hit us with a 20% penalty on aggregated high account amounts for 2003-2008 on top of interest and 20% tax penalty from 6 years of amended returns is a LOT OF MONEY, and it feels like it is being openly taken from us unnecessarily and unfairly. My Australian wife says, “It is like England sending convicts to Australia for stealing a loaf of bread!” These extra penalties are over-the-top retribution, in our opinion, and not commensurate with the nature of the failure. In this regard the IRS is using a hammer to kill fleas. For many of us otherwise law-abiding ordinary people, the embarrassment of not understanding what we needed to do or benignly overlooking some rule that didn’t seem important or relevant; the extreme anxiety, fear, and hassle of the past few weeks trying to gather together all the required information; the cost of hiring CPAs, Attorneys and amending the necessary returns; the cost of paying back taxes, plus interest, plus normal penalties; and the threats of prosecution and imprisonment is severe enough of a lesson without piling on more! Please! With this letter we are just asking for some empathy, understanding, and reconsideration of the negative impact of this process on us ordinary people. Currently, we are living in fear of the coming financial impact for doing what is right, and voluntarily declaring our errors. The financial pain inflicted will be severe! Thank you for your kind consideration of this plea. You hold the power for compassion and can modify the application of penalties. We hope you can find it in your heart to apply some discretion. My second letter to Shulman came at the end of the process some 21 months later. I was struggling to get someone to apply some discretion, and Opting Out was still a BIG unknown. The main plea of the letter was 3 pages, but it is actually much longer with all the all the documentation and summary statements I provided for all the attachments I included. It made for a thick file. I wanted someone to see all the excruciating detail a Minnow was put through by outlining each and every letter and contact I had with the IRS. I just am putting this up here, for those IRS nerds to see the efforts at communication I made, all of which, inside the OVDP, were to naught. I am writing you as a follow-up to my letter dated October 18, 2009. It was written a few days after I had applied for entrance into the 2009 OVDP. (Exhibit B is enclosed for reference.) At that time, I was hoping for reconsideration of the onerous penalty structure that was being applied. Now, 21 months later, that process is still incomplete, and I want to express my experience, frustrations and suggestions related to the program. I know you can not personally read all letters that you receive from tax payers. However, I hope someone will review my file as case study of a program with good intentions, run amuck, and arriving at ridiculous outcomes. I will try to brief in summary (3 pages max), as much of a struggle as it is. However, I will attach the entire history that maybe someone will review, please! Current Situation: After a long distance drawn out process, via mail and phone calls to and from New Zealand (no email allowed), I am now in the 20 day countdown (12 days left) to decide to “Opt Out”, or be thrown out of the OVDP into an “irrevocable” program of great uncertainty. My current 906 settlement statement calls for an OVDP penalty of ~$172,000 for a tax failure of <$21,000 over a 6 year period. The taxes have been paid in full with interest and penalty. We were not the target client of the OVDP program, as we have repeatedly pointed out. We were not deliberately moving ill-gotten gains or unreported income to foreign accounts for the purpose of hiding funds in secret Swiss UBS like accounts out of reach of the IRS. Instead we were just simple expats and immigrants who are not financially sophisticated and weren’t aware of the rules. I understand the IRS position, that arguably, we should have been. That is your world. You are the technocrats that live your lives immersed in rules and regs at IRS.gov. We do not. We were living plain vanilla non extravagant lives in semi-retirement in New Zealand, which is not exactly a banking haven for tax cheats as there are no bank secrecy laws. We were negligent, maybe, but not criminal and never heard of a FBAR prior to September 2009. Now setting aside any technical or legalese considerations of willful vs non willful, or reasonable cause vs just plain negligence, does the amount of $172,000 seem like a reasonable penalty for a tax failure less than $21,000 that was voluntarily disclosed and paid? Really? The reason my OVDP penalty seems extreme as compared to the tax errors is technical. The rules of the program allowed (actually required) the “Technical Adviser”, who has no discretion, to include my retirement home, where I am living, in the highest gross aggregate calculation! Why? Because it generated some non substantive holiday rental income in 2003, 2004, 2005, so it is included. If there had been no income, it was not included. There are no de minimis rules, or intent of ownership. If there is $1 of income, it is included. End of Story! Black and white! No Discretion!! It is the total removal of discretion in the OVDP or ability to make reasonable determinations if results come out as absurd, as in our penalties, which is the major fault of the program, I think. I understand the IRS goals as stated in the 2009 OVDP was a “uniform and coordinated approach which was designed to make exposure to civil penalties more predictable and offer uniform penalty structure.” However, at the end of the process, prior to issuing a 906 is where discretion could and should have been applied. That would have assured that someone, somewhere did the “penalty reasonability test” as related to the compliance objective that is so much part of the letter and spirit of IRM 4.26.16.4. What the IRS is doing with the application of OVDP penalties, such as in our case, seems just punitive in application, confiscatory in practice, and not positively corrective in its compliance objective. The IRS, to its credit, has attempted to modify the OVDP program since I first wrote you in 2009 with my concerns about the misdirected efforts. There are new provisions in the 2011 OVDI that attempts to eliminate some sinners from the egregious penalty structure. I think that you have realized your OVDP was bringing in a lot of small fish which were not the target of the program in the first place. That is why I was asking for relief back then, as that is what I feared. However, the approach of using additional technical adjustments still doesn’t address the core problem of lack of discretion somewhere, anywhere in the process. It is just adding some pretty arbitrary thresholds to re-define the penalty application. It doesn’t work! Case in point: The new 2011 OVDI has provisions for 5% or 12.5% penalties for lesser amounts, or new thresholds like < $10K income earned in US, or < $75K in overseas accounts to apply different penalty levels. That seems better, but again, that leaves it to a “Technical Advisor” to apply a ‘non thinking’ approach to penalty application. If it is less than $75K, one penalty applies, but heaven help you if it is one dollar over $75K, full-blown penalty applies. No discretion! Black and White! A home value is brought into the penalty structure for calculating a high aggregate amount even though it wasn’t an account the FBAR penalties are supposed to be all about. If there is even the most minor or non substantive income, it is included. $1 dollar of rental income or $100,000 of rental income, it doesn’t matter. Black and White! No discretion allowed! End of discussion! You know, I was actually in sympathy with the intent of the program when it started, and its attempt to get the big tax cheats into the system. For the cheating “Whales” that have come into compliance it is a great and fair deal. However, it is a “Minnow” fertilizer factory for us. I think the IRS has gotten hung up on “uniform” penalties when they should have been focusing on an ‘appropriate and reasonable” penalties. Justice is never uniform, and each circumstance is different. There is nuance. In America, we don’t punish jay walkers and bank robbers with the same sentence. Do we? It is this lack of discretion that produces over-the-top absurd results that is in total opposition to your compliance objectives, and I state again, not representative of the spirit and the letter of IRM 4.26.16.4 penalty guidelines. In the current 2009 OVDP program, the IRS created penalties totally divorced from the tax or compliance failure. It is just a uniform 20% of the high aggregate account balances and some assets. That is why we now find ourselves subject to a non discretionary penalty for a tax failure of < $21K over 6 years as compared to, say, Tim Geithner’s tax failure of >$42K. His penalty - nothing. Ours – $172K. I hate to bring in this example, but what is wrong with this picture? Why is one tax failure better than the other? Where is the uniformity? Missing FBARs makes that magnitude of difference? Was that really the intention of Congress and the Statutes enacted? If the OVDI or OVDP process provided an avenue for a Big Picture “reasonability test” on the penalties (management discretion to adjust) before a field agent sent out the 906 closing agreement I would have less complaints. I may still not like the result, but at least I would know that someone was using the discretionary guidelines that are in the IRM. At least I would know that there was measured, nuanced justice, not a so-called “uniform” justice-by-the numbers. Does my logic make sense to you? Am I connecting? Can you empathize with that perspective at all? Can you feel our pain and hear our frustration? To their credit, my examiner and her manager spent a lot of time trying to determine if they could remove my house value from the penalty structure because they wanted to be reasonable on penalty application. But they were over ruled by the “Technical Adviser.” No discretion allowed! And, no one else, it seems, in the IRS hierarchy has the power or wishes to apply the discretion of a reasonability test to the ridiculous OVDP penalties which the process produces. Pleas for discretion within the process, as I have documented in the enclosures, have had no effect except to tire my examiner. The only option I now have after 21 months of expending 100s of LCUs (Life Credit Units) and providing full audit disclosure and open cooperative effort, is to “pay up”, “Opt out” or get “kicked out”. Given the unknown IRS mindset outside the program, it is a very risky decision considering how FBAR penalties can technically be assessed per CD or term deposit account. Additionally it is a very expensive in LCUs and money to now be forced to go through more audits and rely on an appeal process outside the OVDP as your only avenue for relief. I can not possibly afford the huge attorney fees that would require. It would also consume a lot of IRS resources, needlessly, to re-discover what you already know. I am a Minnow. So, maybe you understand why I writing once again, to see if there was another way. Maybe not. I fear not. Maybe I have to be the collateral damage of the OVDP drone program, however, I went into this process naively thinking reason or logic will prevail in the end, but so far, it has gone the opposite direction. Frustrating! Case study chronology of the 2009 OVDP process for just me with documents. Below is the sequence of major events in this entire OVDP process with event dates that has brought us to this point. I have included all relevant correspondence. A lot of LCUs (Life Currency Units) have been expended here that don’t figure into penalty calculations. September 22nd, 2009. We first learned of our liabilities and the OVDP program from a story on NPR about UBS tax cheats the IRS was going after. That led us to consult with an attorney and a CPA for the first times in our lives. Thus began an education on a world of regulations and rules we never knew existed. It was the beginning of a long and frustrating process. October 8th, 2009. We submitted an amended 2008 tax return which was done by the first CPA we have ever used in our life, and paid the additional $904 of taxes due on an amended 2008 1040. We were introduced to the form 1116, Foreign tax credits. What a complicated form that is! We didn’t get credit for all the tax we paid in New Zealand for reasons our CPA could not explain. We also mailed in all 2003-2008 FBARs after a lot of hard work gathering banking records. Our files were at our home in New Zealand, and we were just temporarily in the States visiting our family. We had to get this done by the new Oct 15th deadlines we just discovered..
October 18th, 2009. We wrote Commission Shulman a letter pleading our case that we were not the target audience of the OVDP. We feared we were entering a process designed for “Whales”. However, it had a net mesh so fine, and was cast so wide, that the “Minnows” like us were going to be caught, placed on a “uniform” conveyor belt process and spit out the end as fish fertilizer. Also, on one of our amended returns, 2006, they took the money, but sent a letter which said since our income tax failure wasn’t substantive, they couldn’t accept it, again, due SOL. We could apply for a refund if we wished by December 2012. With our amended tax returns finally finished, we waited for the fateful call from an IRS examiner. Then I waited, again. Tension building! In early June, 2010, I received the first phone contact from a very congenial audit agent out of Phoenix. It was followed a few days later by the standard IRS form letter requesting that we produce a lot of material for auditing. Boy was that fun! Not. June 9th, 2010. Contacted my examiner by phone after receiving the letter, to let her know that I would not be able to met the deadline for submission, as the data requested would take a lot of time to compile and audit before I could send to her. Went to work collecting, organizing, auditing and detailing a comprehensive response package. August 15th, 2010. I produced and mailed an the incredibly comprehensive pile of paper required to be disclosed including all by bank records, tax returns (original and amended) all FBAR copies, my calculations of the highest aggregated account balance, calculations of all interest payments received in NZ and Australia, and express mailed it from New Zealand to Phoenix. It was a BIG package and cost $80 to send. In my production and review, I went back over all my amended returns, to be sure they were accurate and re-audited it in detail putting myself, into an examiner’s mindset. If I was doing my examiner’s job, how would I want to see the information? That uncovered a few minor errors which when both ways, in my favor, and in the IRS favor. I disclosed and corrected them, even a mistake made by our CPA on the handling of my minor US pension payment which he mistaken listed as tax exempt in 2008. Not sure how that happened, but for that, I had paid him over $1000. I shook my head in wonder. At least I got an education that allowed me to follow his work on the form 1116 for subsequent year amendments which I did myself to avoid more expense and costly errors. I also went over my all bank CD/Term account statements in detail, and highlighted ever deposit and withdrawal with a comprehensive legend so an examiner could follow it. I also created a fund flow sheet to be able to follow the movement of term deposits we had which matured and were moved to new accounts based upon the interest rates available at the time. It was all the same money, but each time a maturity was reached, often a new two number suffix was assigned to a bank account number, creating a new technical account which, don’t you love it, the IRS could assess a separate FBAR penalty, as I learned painfully later. Finally, as support to ridiculously complex form 1116, Foreign Tax Credits, (which no human alive could read the instructions and understand them in full) I detailed every interest payment and tax deduction which showed up on our bank accounts to assure that each of those tied to the actual bank records and the form 1116. Boy, was that exhaustive effort. I am not a CPA, or even an accountant. I did not play one in the movies. I have never had an accounting class in my life, but I have learned to work a spread sheet, and though it is not my favorite activity, I can do the Drudgery of the Numbers if it is required. I can’t imagine how much this would have cost me if I had a Practitioner or a POA (my examiner’s preference, btw) do all of this. I saw on a blog that some poor fool (I use the term affectionately because I include myself in that characterization) had to put on adult diapers when he got the bill from his Attorney for $200,000. At least I have avoided that expense by doing all of this detail drudgery myself. However, a real deficit of LCUs was created with all the hours of effort. At least 120 or more were expended, but I lost count. After Christmas 2010, I received a call from my examiner, that due to IRS workload, my files had not yet been reviewed, (I imagined a BIG stack of papers sitting on the floor in a corner someplace) but would I please provide the valuation on my house so the form 4549-A, Income Tax Discrepancies and form 906 Closing Agreement could be prepared. I got my first hint that something was going sideways, when the examiner said my home value might have to be included, but I wasn’t to worry yet as she was reviewing with her “Technical Adviser”, as that didn’t seem right. Could I please provide more information about the circumstances of acquisition of my home and the reasons for our holiday rental income, non substantive as it was. February 2011. John McDougal removed the discretionary provisions of FAQ 35 from use in the field for the OVDP program. Have just seen this reported on the web and in blogs, but have never seen it in writing from the IRS. As of this date the provisions of the 2009 FAQ 35 is still on the IRS.gov site. It has been stated that there was mis-communication in the agency about application of penalties, that caused the confusion in the field. It was always the “intention” of the Commissioner (blame Shulman?) to compare OVDP penalties to the Maximum penalties allowed under the Statues. But, of course, that is not what FAQ 35 said. If you got in your request for FAQ 35 consideration before February, it would be honored. If it was after this date. Tough. Another technical barrier, added to the program after the fact without any written documentation. March 10th, 2011. We received the preliminary form 906 Closing Agreement. Our proposed penalty was to be ~$172,000 plus interest and 20% accuracy penalties on our amended returns. Our hearts stopped and the fish fertilizer fear appeared as a very possible outcome. I was STUNNED!! Up to this point, I had been figuring worse case scenario the OVDP penalty would be around $80K. That had given me enough heart burn that I had written Commissioner Shulman at the beginning of this process asking for relief as mentioned previously. (Exhibit B) Now this? What could I do? March 11th ?, 2011. Finally broke down and contacted a well know and well-regarded Tax litigation attorney Jack Townsend to review our case and explore other avenues available to us to mitigate penalties. We also reviewed the implications of an Opt Out including the legal processes for appeal. That conversation was very helpful, but VERY EXPENSIVE too. He said maybe I would have to consider an Opt Out and take my lumps. That was the first I had heard that was even possible. What did that mean? We had thought, that once we had learned of our FBAR compliance failures, we had no option but to voluntarily disclose via this OVDP program. To do differently, like just doing a silent disclosure was dangerous. We would certainly guilty of a “willful” action if we did that. I hadn’t felt that our failures were of the willful type the IRS was going after in this program, but now I was beginning to understand, that in the legal and technical world the IRS lives in, the IRS was defining “willful” in some pretty broad terms. While the burden of proof was on the IRS to prove “willfulness”, fighting that determination, and even with court cases going against the IRS on their “willfulness” determination, you could burn up more time (LCUs) and more legal expense than the OVDP penalty in the first place. Very, very frustrating. Below I have attached a 4549-A Excel workbook that you can use to audit the Examiner’s work. I highly recommend that you audit it line by line, as I did find errors. The Work book comes with a summary sheet which is linked to each year’s tab. All sheets are protected, but no password is used, so you can un-protect it to add additional rows if necessary, or add and link up additional years sheets. March 29th, 2011. I wrote my examiner about the 906 calculation to inquire how she had determined the highest aggregate. (See attached Exhibit J) Frustration is building here, and there is a long editorial on the process. That now just sits in a file somewhere without seeing the light of day, or getting any management review and discretionary consideration. It is not allowed in the process. April 13th, 2011. Left our home in New Zealand and traveled via Australia on our way back to the States. Had advised my examiner of our travel plans in Exhibit J, and via phone conversations. Arrived back in Seattle, April 22nd, and continued my phone contact with discussions about 4549-A and the 906. April 14th, 2011. Received several voice mail messages in Australia about my audit of the 4549-A. After telephone tag, we agreed to talk in detail when back in the States and I had my spread sheet and her documents in front of me for review. May 3rd, 2011. Had a lengthy phone conversation about the form 4549-A and the 906. We resolved our differences on the 4549-A, but not the 906. Discussed Opt Out, and what that meant. She strongly advises that I get legal advice, if I thought that I wanted to do that. In the intervening days, I spent a lot of time reading Legal Blogs on the OVDI and OVDP processes. I also printed and studied the IRM 4.26.16 on FBAR laws and penalty application. I was trying to self educate, as attorney costs for this specialized area of tax compliance is very expensive. I reached out to American Citizens Abroad for attorney suggestions, as I probably did need some more advice. May 13th, 2011. Decided to write another letter to my examiner and officially ask in writing for FAQ 35 consideration, even though she has verbally indicated before it wasn’t available to me. Still looking for where it is in writing that it was removed. (See attached Exhibit K ) Frustration with the process is really rising. May 18th, 2011. New 906 issued and arrived in the mail to include changes I had made in the penalty calculations. 4549-A still not correct to show tax payments made in January of 2010 and not yet recorded properly. 4549-A form shows I still owe taxes, and actually I should have a balance due me, as I had over paid to stop penalty calculation. June 2nd, 2011. Downloaded latest OVDI and OVDP “Opt Out” procedures as issued by Stephen T. Miller, Deputy Commissioner for Services and Enforcement. Not much encouragement there. Lots of questions for my examiner as to what it means. There are some vague statements about “cases being assigned for other treatment.” Huh? What does that mean? It is obvious, in the factual statement I have to produce for our Opt Out, in the key consideration, she and I disagree on what constitutes “willful”. I understand her perspective, but just disagree with it. She is taking the hard and fast / technical route that a checked box indicates “willfulness” not to file a FBAR. There is a wide gulf here between us on what is considered willful. We have a spirited, but respectful conservation about the IRS perspective, versus the taxpayer who doesn’t live in her technical world. She does concede that we are not the same degree of willful as those hiding funds in Swiss Accounts. So are there degrees of wilfulness, in the IRS eyes? Is that considered in the Opt Out. Or is it black and white like everything else so far. Don’t really know. Also, she advised that I should calculate FBAR penalties outside the OVDP as per the IRM based upon each account having a FBAR penalty. Would they double count? First she says, of course not, and then after a conversation with her “Technical Adviser”, she calls back to say, yes they will double count accounts. What?! So, if the same money is in two different accounts in the same year, I am to calculate two FBAR penalties. Example. If my $10,000 CD rolled over to a new CD during a year, it would have to be counted twice as $20,000 in the high aggregate because technically two accounts apply when the new CD with new suffix is issued. Go figure. When you apply that technical standard, penalties can shoot through the roof to absolutely ridiculously absurd amounts. It moves you into mitigation levels in the millions even though we didn’t even have $XXXX in retirement savings in NZ. Will the IRS insist on that level of penalty application outside the OVDP? Surely not, but it is unknown. Would you take that bet? How much money to you want to spend with an attorney fighting that? A big risk to the Opt Out. June 21st, 2011. Received a new form 906 with an accompanying form letter 4564 which was dated June 20th. It basically informs me that if I want to Opt Out, I have 20 days to decide. I have two choices I can make, and one they will make for me. They can not provide advice as which way to go. June 22th, 2011. Called my examiner and her manager for a long conversation about what additional visibility they might have as to application of discretion outside the OVDP. They were polite and professional. They stated that they had heard that the very first Opt Out had just been processed, but no idea of the outcome by the Management Committee given this task. They were in the dark as much as me. As an aside, I wonder who is in the Management committee. If it includes John McDougal, you don’t have a chance, as he is too much immersed in defending all the rules and regs that seem to emanate from him. I could be wrong in my impression. Also discussed what payment programs are available if I am forced to pay this $172K. I don’t just have that money sitting in a checking account. It will take a little while to raise it. I will have to liquidate retirement savings, and maybe transfer funds from NZ. That all takes time. Examiner and her manager don’t seem to know what flexibility is allowed, as they just turn it over to Collections, and have nothing more to do with it after that. I called the Tax Advocacy office, and they think it is a standard 120 days, but I should contact them myself to be sure. I am now thinking the unthinkable as time ticks away, so need to do some contingency planning. June 25th, 2011. We are at the end of the line, so now time to go back to the beginning and the top of the hierarchy. I have tried working within the system, and have had zero success. I called Kevin McCarthy who was the original responder to my letter to Commissioner Shulman. Got an empathetic hearing and a promise that one Victoria Gally would review our case and call me on the 27th. Personal note: I have an abscessed tooth and having a hard time concentrating on this. Popping antibiotics and Advil pills. June 29th, 2011. Still no call from Victoria Gally today. Finish up and sent this letter Express mail to Commissioner Shulman. Final Comment: Hope is running out that any reason will prevail within the OVDP. Outside it is so very uncertain, and why does it have to be that way? 12 days now left until my execution date. Side note: Is this how the Empire slips into decline? Mindless audit processes that bludgeon the middle class while the oligarchy of Corporations and Financial elite just get richer. The deficit widens while Republicans refuse to consider new sources of tax revenue via simplification of tax codes or elimination of Corporate loopholes. So, the IRS is left to try to increase intake, via OVDP and OVDI penalties without any discretionary review. And who is the unintended target? The least powerful of society are the pasties, while at the same time the IRS is giving $3 billion in Tax refunds to GE and they pay no taxes at all. Unbelievable. And you wonder why it is hard not to be cynical. Additional correspondence Documents that followed my Shulman letter above. After I mailed my letter to Shulman, and with 11 days left to “Opt Out” or be “kicked out” decision , on June 30th, I emailed the TAS offices of Nina Olson. 24 hours later I received a call back setting up a conference call. Also on the 30th, I finally got a hold of Victoria Gally and she arranged for a conference call on July 5th. The TAS joined in, and that was the beginning of the end of my ordeal. Below is the correspondence that followed. Just a note to mark the final final end of the OVDP process for me. I guess this particular thread is as good a place to record it as any, as my story transverses multiple threads. So, that is it! I am done. I guess I can stop blogging now. What a wonderful educational process it was, and what a model of efficiency it has been! Can I have my LCUs back please? You know, if it only takes 851 days to process a Minnow, wonder what it takes for a Whale? The question now to be asked what did it cost the IRS in time, energy and dollars to extract the fish oil they squeezed out of me? I can guarantee you that no business would be able to survive on the ROI for this misguided adventure. If you wonder why nothing productive gets done in government and why America is in such a fiscal mess, well wonder no more. If this isn’t a prime example of how to not to run a country, then there isn’t one. It doesn’t give you much faith for the future when the IRS still won’t acknowledge TAS Director, Nina Olson’s TAD. The response was due January 26th, but so far nothing. Probably nothing will come from her report to Congress either, where she so clearly pointed out how egregious their process was for the Minnows. Then to think, 2 and ½ years later, the press has yet to write one meaningful story of what it is like for a Minnow to be involved in a program marketed as an amnesty for catching tax cheating whales, that was then proclaimed a marvelous success with nary a skeptical question from the MSM reporter scribes. (Amy Feldman from Reuters, the sole exception.) Sorry if this drips with cynicism. All the best to the rest of you in the process. Hang tough and “Illegitimi non carborundum”, as they say! Please excuse my mock Latin! If you don’t know what that means, google it. Thanks Jack for the outlet and the forum. Your blog has helped me immeasurably with your sage advice, and providing a sharing outlet for other Minnow’s out there. There was some small comfort in knowing that I was not the only fool netted! I hope they all have better outcomes just like Moby and Sally did. PS… I heard from my TAS officer that they are still helping Minnows trapped in the OVDP/OVDI. She had 4 cases herself that she was working on. So, if you are running up against the wall, I would try calling the TAS DC office and explore your options. They are good people, and do restore your faith in what good government should look like. Last comment: If you have read this far, and I not sure what this says about you, but thanks! Looking back on it, the journey seems even longer than the correspondence that is represented here. If you read or even skimmed a portion of the whole thing, you are a glutton for punishment, but rather that way, then inside the OVDP fish processing plant itself! LOL Thanks for the read and your comment. It is appreciated. I have read that today, and there has been some side emails going on in relation to it…. 1. After ALL of the hoopla and the scare tactics, with the UBS giving up 4,500 names before the OVDP was even launched, the OVDP only came up with 10,500 names with 12,900 FBARs! This out of 7 million overseas Americans?! And, as Roger pointed out, only 4% were actually filed outside of the USA! 2.. Now that they’ve already done this, just how many does Levin think there still are? 3. Since 96% of them were located INSIDE the USA, why don’t they modify FATCA to have the foreign banks only report US citizens RESIDENT INSIDE THE USA! 4. From the earlier report we learned that the OVDP generated about $5 billion, of which 68% was for penalties and interest. So that would be called a “WINDFALL”, not a revenue stream to Treasury. This means that the maximum likely revenue stream would be $1.6 billion. However, since 96% of this revenue seemed to be located inside the USA, that means the expat revenue amounts to a puny $64 million! For this they are imposing the fiscal imperialism of FATCA on all 7 million overseas Americans??? As I’ve said, FATCA is like using a nuclear bomb to kill cockroaches – in the end, it destroys everything that is good but the cockroaches remain. I need advice on whether I should enter the OVDI, the Streamlined Program, or try to do a Quiet Disclosure. Allow to preface this by noting that I have done a great deal of research on this issue. I have spent many hours reading http://isaacbrocksociety.ca/ and http://federaltaxcrimes.blogspot.co.nz/. I know what the options are; I just need to know the best choice for me. •	Have no investments, property, etc. other than stocks in the US. •	Stopped filing taxes because my tax owed was always $0. Made no stock transactions 2007-2012. •	Received notice of above lien too late, as I had moved from my address and forgot to send forwarding address. Lien was deducted from my American bank account and letter mailed from my bank to my American address notifying me of lien. By then, it was too late to appeal. •	From 2007-2012, had nominal American income (<$500 a year from bank interest); made no stock sales during this time. •	Made excess IRA contributions of ~$2k in 2006 (the last year I filed a 1040), ~3k in 2007, and $5k in 2012. I have not yet corrected these and they are therefore each subject to a 6% penalty per year that they remain uncorrected. •	Have never filed an FBAR. •	Value of foreign bank accounts have never exceeded a combined $50k combined. •	On two occasions I held bank accounts in two countries simultaneously; in 2006 and 2009. This was due to the fact that I was moving from one country to another and needed to leave the first account open until I opened an account in the second country. 1) Quiet Disclosure: Submit 1040X for 2006 to reflect 6% excess IRA contribution tax. Submit 1040s for 2007-2013 that reflect 6% excess IRA contribution tax for 2006 (2006-2013), 2007 (2007-2013) and 2012 (2012-2013) and submit FBARs for 2007-2013. Pros: Above-board, completely fulfills tax liability. Cons: IRS frowns on QD; fact that I filed and then stopped filing may be grounds for willful neglect, resulting in devastating penalties. 2) Streamlined: Submit 1040s for 2010-2013 and FBARS for 2007-2013. Pros: I could get tax compliant for these years. Once I clear streamlined, I could file a 1040x for 2006, 1040s for 2007-2009, and 1040x for 2010-2013 to clear up the excess IRA contribution taxes. •	The IRS says “This procedure is available for non-resident U.S. taxpayers who have resided outside of the U.S. since This procedure is available for non-resident U.S. taxpayers who have resided outside of the U.S. since January 1, 2009, and who have not filed a U.S. tax return during the same period.” I have not filed a return since this date; however, I did file one while living abroad in 2001-2006. •	Get caught up in a massive bureaucratic nightmare. From what I have read online, it took years and years for people who made seemingly innocent mistakes to resolve their problems. Based upon this information, what should I do? I don’t know if this is the right place (I’ve searched the site and couldn’t se anywhere else) and I apologise if I’m out of line but I’m looking for other Kiwi’s downunder who are caught up in this big giant mess so that we can support each other through it all. It’s very hard for outsiders to understand never mind that we must be very careful what we say about anything. Sharing of information and resources could be useful too but there is a lot of that online so simply moral support would be the goal. Anyone out there? This thread is not very current. May I move it for you to a more active one? I understand but we know he is taking a break from all things expat (after a relentless effort to CC&W (Complain Comply & Warn) and is off somewhere backpacking. @Trisha Moon … We all do so appreciate their willingness to share their story. I hope that there is some relief for him and his family and they can enjoy some rest and recreation now. An update on how TIGTA is urging that the IRS impose more FBAR penalties and raise more FBAR revenues from those who opted out of or didn’t follow through with the OVD programs (“…The Internal Revenue Service (IRS) needs to improve its efforts to address the noncompliance of taxpayers who are denied access to or withdraw from its Offshore Voluntary Disclosure Program (OVDP)…”) TIGTA apparently looked at some cases from 2009 -2012 (or later), and directs the IRS to go back through some and followup to see if they can squeeze them for more penalty and other revenue. Courtesy of @Neill on another thread. Worth reading the whole TIGTA report https://www.treasury.gov/tigta/auditreports/2016reports/201630030fr.pdf – to see how rabidly and avidly they assert that much more FBAR penalty revenues should have been pursued and asserted – they are admondishing the IRS that those who opted out or didn’t continue in the OVDP (several iterations of it) should have been penalized with FBAR penalties. And they assert this based on no evidence – especially as the FBAR, reasonable cause, and willfulness is supposed to be based on specific facts and circumstances of each case, not on whether TIGTA or the IRS is unhappy that people opted out or chose not to pursue OVDP and pay the ‘offshore in lieu of penalty. I read that TIGTA report, and thought, these guys are just sick greedy bastards. All they care about is penalty revenue! With Hillary, figure more of the same, athough I shutter to think what a Donald would do. Definitely voting Libertarian this year as a my vote in Washington state won’t matter, as it is in the tank for the Dems. @Just Me, thought I’d try to keep following this story though it had gone increasingly opaque out there, and scarce commentary even at Jack’s site where sometimes there was very valuable information or hints of developments from commenters and people entering, exiting, opting out, etc. We have no idea how many are left unresolved from which version of the OVDs. Likewise no stories from Streamlined. Interesting to compare TIGTA’s 2011 report on IRS’ operation of the 2009 OVD https://www.treasury.gov/tigta/auditreports/2011reports/201130118fr.html vs. this latest. Interesting also the IRS responses referencing the Taxpayer Advocate. Who knows what the IRS will do next – especially now after the goading from TIGTA. Take care, and hope you are maximizing those LCUs. You have helped countless stay out of the quicksands – which continue to threaten. Always a good day when we get a comment or two from you / your point of view. And, of course, from badger, who highlighted Neill’s find. Definitely maximizing those LCUs… Last years PCT through hike was really a positive for my attitude. I have been reliving some it since coming back from NZ by doing some car touring around the PCT route in southern and northern California that I walked through, but my wife had not seen. That has been really enjoyable. Been staying away from the news and politics as much as I can, and ignoring these bastards at the IRS egged on by their Dem sycophants. I am staying a compliant little serf, and need to get my FBAR done in the next 8 days if I can figure out how to get the latest Adobe Plugin to work in Chrome. Typical with the IRS, make it as complicated as possible to file, while doing their work for them, and then cause the taxpayer to expend maximum LCUs just to meet their ridiculous demands. Don’t you just love those friggin’ bureaucratics elitist that they are. But I digress. Me and my family are well, except for mother who is 90 now, and the last sibling standing out of 8. Just moved her into a care giver home, and now dispensing with her life’s treasurers via Goodwill donations, Craigslist and Estate sales. What fun! Fortunately, she doesn’t know it is happening. Selling her house to finance her expensive care in her “golden” NOT years. She worked hard all her life, saved every penny, and is fortunate that her house value means she can have the care she deserves. Cheers to you and Badger, and thnx for asking. Thanks for the update, Just Me. Glad you’re well and able to support your 90-year old mom at this time of her life. Wow, 90 years. I’m glad she has assets like her house to help with her now expensive care, a whole ‘nother topic. Anyone who knows you here at Brock will realize the attention you’re putting into helping there. Best to all of your family. Good luck on meeting the deadline for another year of those FBARs. Glad your Pacific Coast Trail adventure continues to provide benefits and revisiting parts of it with your wife must have been special. And, the LCU account is getting recharged – great. Hope you continue to give those of us you’ve helped so much surprise visits now and then. It’s good for our LCUs. and thanks. There is a warm spot in my heart for IBS and folks like you and Badger. All the best. A good example of how serious the problem of “unofficial” IRS guidance can be is evidenced by the IRS “Offshore Voluntary Disclosure Program” (OVDP), which was accused of IRS “bait and switch” tactics. Taxpayers with offshore assets and those living abroad are likely very familiar with the OVDP. Even with the critical importance of the OVDP and its monumental impact on thousands of taxpayers’, the OVDP is governed only by a long series of FAQs (and much agency secrecy). Taxpayers must be reminded these FAQs are not binding authority, even though the FAQs themselves do not indicate any warning to taxpayers or their advisors of this fact. The OVDP FAQs were issued in such haste and so poorly drafted that the IRS had to clarify them repeatedly. As a result, they treated similarly situated taxpayers inconsistently. These FAQs are frequently the subject of disputes. The IRS changes them regularly without providing any formal record of what changed and when. For example, between March 1, 2011, and August 29, 2011, the IRS made twelve changes to the 2011 Offshore Voluntary Disclosure Initiative FAQs, which were entirely removed from the IRS’s website in 2016. And as I noted in my recent FY 2018 Objectives Report to Congress, only certain practitioners know how the IRS interprets them. Disputes arise when it does not interpret them in accordance with their plain language. Taxpayers and practitioners who do not work on OVDP cases often are at a disadvantage because they do not know how the IRS interprets its OVDP FAQs. This approach is unfair to taxpayers. Although the IRS may have felt an urgent need to provide OVDP guidance as FAQs in 2009, I see no compelling justification for continuing to run its OVDPs this way over seven years later. At the very least, the IRS should publish its FAQs and all updates to them in the IRB. It should also give serious consideration to issuing the OVDP FAQs using the notice and comment process established under the APA. Such a procedure could help avoid the problems large numbers of taxpayers have experienced with the OVDPs to date. “…………. Getting involved with OVDP or the IRS in general is like sliding down a slippery slope (hands tied and blindfolded) into a quagmire infested with sharks. Nobody and I mean nobody could perfectly navigate those ever-changing OVDP FAQs. Who could even keep track of them when they changed so often, without notice and without a record of the changes? Who can know where they stand when the IRS reserves the right to make up the rules as they please, change them as they please and interpret them as they please – and do it in secrecy? In one case (can’t find it now) I remember that the lawyer or client was able to prove the changes because they had screenshots of various versions of the FAQ webpages, or saved versions (via the Wayback Machine Internet archive?). What kind of fairness is that? “…….For example, between March 1, 2011, and August 29, 2011, the IRS made twelve changes to the 2011 Offshore Voluntary Disclosure Initiative FAQs, which were entirely removed from the IRS’s website in 2016. ……..”. Given the IRS OVD backlog and how very long people were in the OVD programs, they could have faced more than 12 changes to the FAQs in 2011 alone.